Great book. Great insight. Funny as all it could be. So enjoying the tale and honestly recommend it to all, not just those who might be thinking of heading over there to teach. For anybody thinking of the JET Program or doing any TEFL work this would be an essential manual on how things really work over there. A "must read..." - The Crazy Japan Times and Japan Rough Guide! Less than six months after chucking in his management job to take up teaching Nicholas Klar finds himself on the JET Program and a plane to Japan - ending up as an ALT teaching English in Omi (now Itoigawa City) in the far reaches of rural Niigata prefecture - see map below or click here to see a movie (Japanese only). Never one to be taken too seriously he spends two years far beyond the beaten tourist path in often carousing encounters with Elvis impersonators, love hotels, toilets, train schedules, cults, hostess girls, freezing weather, the local garbage-man and postal workers, plus the recording of a bizarre incident where a cow apparently falls out of the sky. 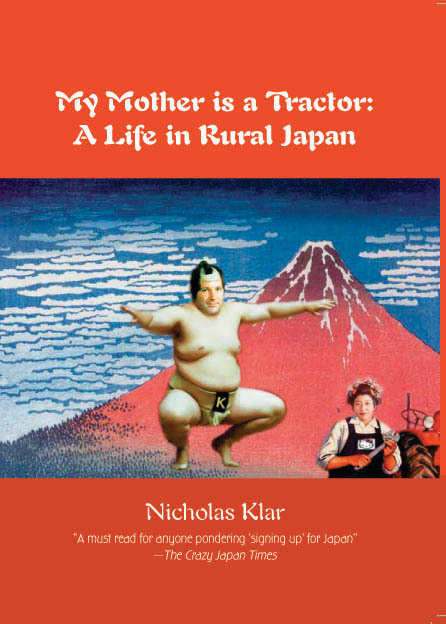 My Mother is a Tractor is rollicking, fact-filled ride through the Land of the Rising Sun that will both amuse and inform. Note: If you are interested in doing a book review for your publication or website please contact me. Purchase hard copy securely online now direct - $19.99 inc. postage!